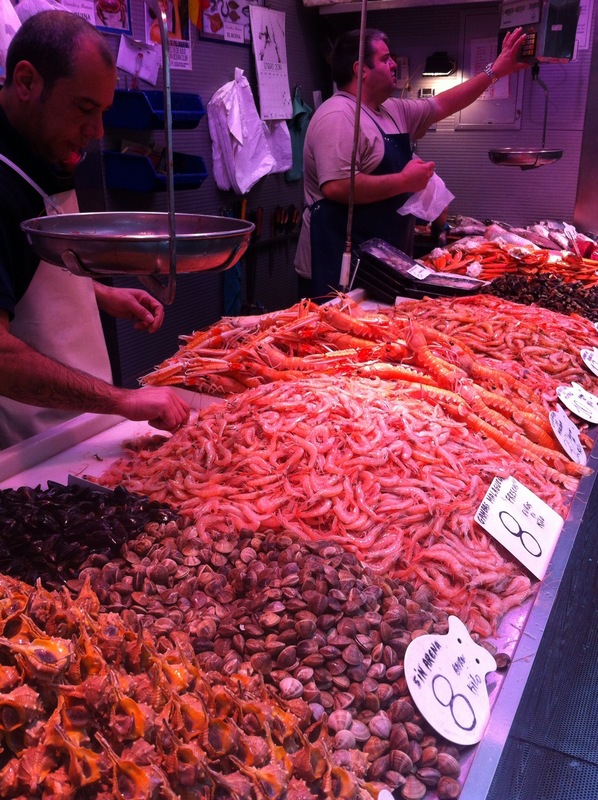 Unusually, I have written very little about food in this blog. Strange, because it plays an enormous part in my life. And it’s different here in Spain. Not just the food, but the rituals around it, and the general approach to food. There’s a respect for the produce that I think we have entirely abandoned in the UK. We have lost almost the last vestige of connection with where food comes from. Children, asked where a carrot comes from, look blank. Asked where cheese comes from, they answer Tesco. You can laugh at this, but really we should be crying. And fixing it. Look into the average trolley in a supermarket and you can be pretty sure that a lot of parents aren’t going to be the ones teaching their children about produce, quality, and the politics of localism. I’m not a total purist. I sneak the odd prepared meal into my shopping, even here in Spain. But much less than I used to. Of course it helps that my neighbours occasionally deliver a delicious bag of fresh vegetables or eggs, an enormous jar of honey direct from their bees, freshly-picked oranges when I had a cold, a home-made tub of dulce de membrillo, or 5 litres of Rafael’s own olive oil. Yet even without that, I recognise that my eating habits have changed dramatically. It starts, of course, with the shopping. 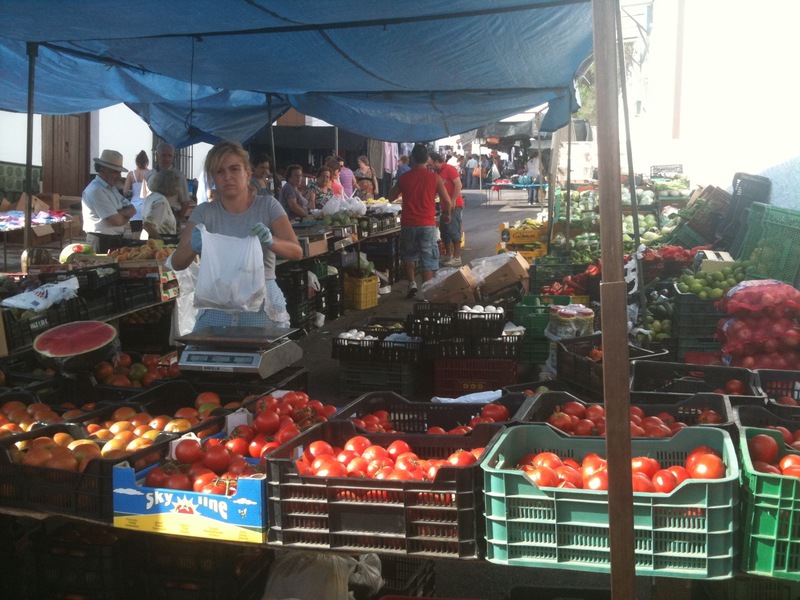 The weekly market is wonderful for fruit and veg, and in between Supermercado Richard has a great selection. The other shoppers demand only the best produce, loudly and scornfully rejecting anything less. 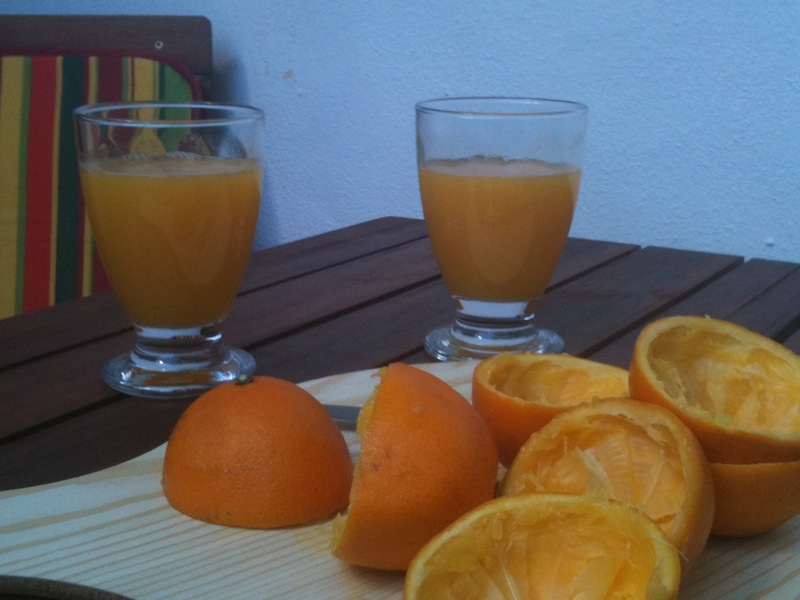 But “the best” does not mean uniform, perfectly-shaped fruit. It means highly-flavoured, recently and locally-harvested, often mis-shapen, and ready to eat. You quickly come to learn which panadería you like best for crusty morning rolls, and which for cakes. Which carnicería is best for pork, which for chorizo, and which for prime beef fillet. And I am finally learning to enjoy cooking. Though even better is watching other people cook. Juan came and cooked a massive paella in my house last month when I had a cold, even making the caldo (stock) from scratch. It was superb. And I have four more portions of it in my freezer, despite giving him back a big tubful to take home for the next day. From Roberto I have picked up some Cuban cookery – few ingredients, but beautifully flavoured and cooked, like orange chicken on black beans and rice. One of the biggest differences isn’t so much the food itself, as the style of eating. Here in restaurants in Spain I have often seen huge groups of extended families ordering mountainous plates of food, yet when it comes it sits there in the centre (it’s always for sharing, never a dish per person), and the conversations continue. Many times I have felt frustrated and wanted to shout “Eat, eat, before it gets cold!”, completely failing to “get” that the gathering of the clan is by far the most important thing that’s going on around the table. Not that the food doesn’t matter. Eventually one old boy extends a fork, spikes a piece of meat, cuts it on his own tiny plate, takes a mouthful and savours it, pointing and encouraging others to share the flavour and succulence. A couple of gambas (prawns), a slice of garlicky tomato, a spoonful of porra. Each flavour is exclaimed over, focussed on, and shared. These folks recognise good food, alright. And that extra value that appears to be put on it, maybe comes from the increased awareness that Alfredo in the bar makes the best porra in the province, from his grandmother’s recipe, from the tomatoes and peppers he has grown, flavoured with just a splash of his mother’s secret ingredient. That the jamón was collected from his cousin in the Alpujarras, who raises the valuable Iberico pigs and whose black-label hams win prizes every year and are much sought-after. People know that stuff about the bars they eat at, and it matters. Simple food, with a cracking good flavour, and all traceable. Food to be lingered over, savoured, respected. Memorable food – not least because of the people who produced it and the people who prepared it with real care. My strongest memory of how food is valued and respected for the work that has gone into bringing it to the table, came last year when our little callejon had a fiesta, a street party to celebrate our third place in the village’s Corpus Christi altar competition. Rafael had a little barbecue grill going in his garage, despite the tables groaning with food between his house and mine. The men were in there, sharing some beers and putting the world to rights, while we women were out in the street, making sure the children and the older women had food before helping ourselves, and congratulating each other on our offerings. Rafael beckoned me into the inner sanctum of his garage, stuck a toothpick into a small square of bacon on his grill, and offered it to me as though it was a 100-carat diamond. And, do you know? – it was better than that. The bacon tasted more bacony, the fat was crispy and the charring just right. It tasted a million dollars. Partly because it was, in fact, the tastiest morsel of bacon that had ever existed, and partly because it stood for so much more. My acceptance in the street. The friendship of my neighbours. The ritual of the sharing of food and all that is implied within that. But even leaving all that aside, honestly, never was there bacon so bacony. Because Rafael had bought that young pig with money hard-earned on his land. He’d fed that pig with food he had grown and acorns he had harvested from his trees. He’d brought that pig to his family, to feed them through the year. He knew the value of that morsel of bacon. And, through him, so did I.
PS – If you read and enjoy this blog, would you vote for it in an international travel blog competition? Simply click THIS LINK, then click the little button to the left of A Foot in Two Campos”, scroll down through all the other blogs and then click VOTE. Thank you! A food-related reminder of the importance of ending words with the right O or A. 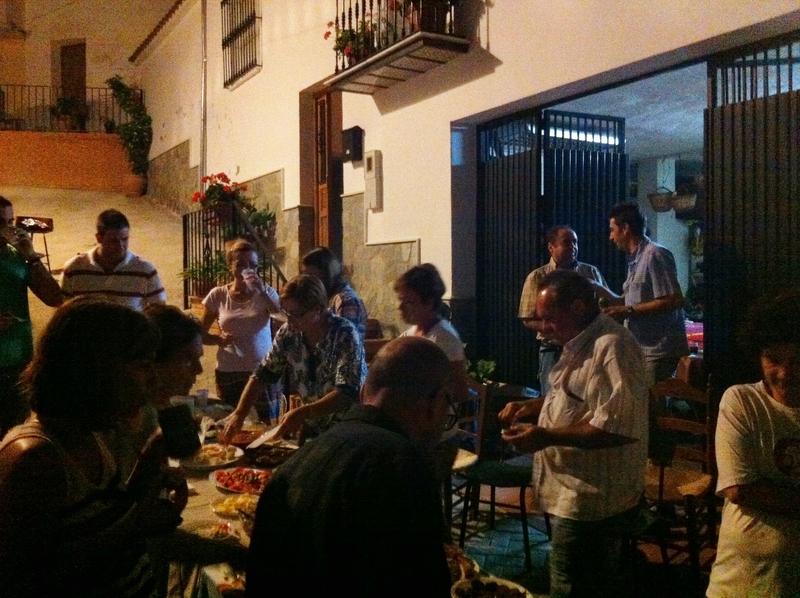 Along with eight friends over from Cumbria I went on a Ruta de Tapas with www.tapasinmalaga.com (a fabulous evening). The first bar on the tour served the most delicious garlic potatoes, squid, and their own recipe for porra, which is a tomato-based garlicky dip with breadcrumbs, red pepper and olive oil, served cold. Similar to salmorejo which is more common in la Provincia de Córdoba and doesn’t have the peppers (folks will argue about those definitions but that’s what several chef friends told me, anyway!). Anyway, one of the women absolutely loved it, and when the waiter came round to see if everything was alright she loudly asked for another large portion of porro. The waiter’s face was a picture, as that small matter of an o at the end instead of an a meant that she had asked for a large marijuana joint! 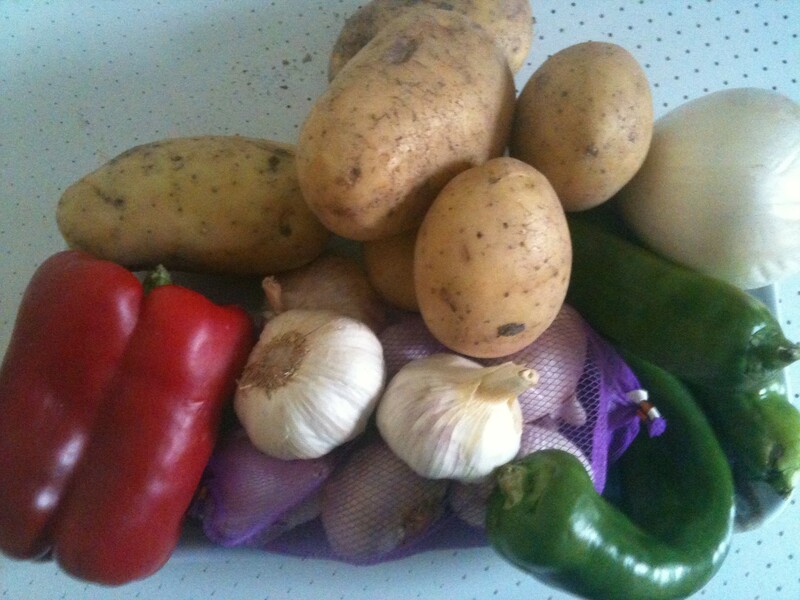 This entry was posted in Spain and tagged Andalucia, Axarquía, Colmenar, food, learning Spanish, market, Spain, SpanishBlog by tamaraessex. Bookmark the permalink. Thanks Lynsey – that means a lot coming from a real foodie like you (everyone go read Lynsey’s yummy foodie blog at http://larosilla.info/). Damn – now I won’t be able to order “porro” OR “porra” ever again! You can use ‘porra’ like ‘damn’, for example: Porra! Now I won’t be able to order ‘porra’ ever again! It’s the magic of Andalucia ,the almost sacred rituals that surround eating with family and friends in these Pueblos Blancos .Such a wonderfully descriptive piece .You’ve captured the joy of caring and sharing and being loved .For me it’s full of emotion . The photos are lovely , creating tiny tableaux and adding to the beauty of the words .It’s Duende . Thank you for the mention Tamara, we had a fun evening with you and your friends on the Gourmet Tapas Tour in Malaga. I did not hear your friend order more porro (otherwise my smile would have been as big as the waiters!) It is an easy mistake however!